Where Was the HH Holmes Glass Bending Factory? Now that I’m running ghost tours again, I’m back to making regular visits to to little stretch of road once known as Sobieski Street. Here, in 1895, police found a building that H.H. Holmes, America’s first known serial killer, had said was a glass bending factory, but which was more likely a body dump. Some personal effects belonging to Minnie Williams, one of his wives (who had vanished, along with her sister, Anna) were found there, along with some ephemera from the ABC Copier Company that Holmes had operated in the Loop with much of the gang from the Murder Castle, his famous south side building that was equipped with everything you need to kill a person (and dispose of the body). Patrick Quinlan, the murder castle janitor, had been to the glass bending factory about a week before police arrived and carted out quite a lot of garbage. Some notes found in the rubbish indicated that there had once been a furnace large enough for cremations in the building. I started taking people to the little stretch of road where the “factory” was just as a curiosity to add to my Holmes tours, but we had enough weird nights there that I added it to the ghost tours. This is the place where we saw a woman in a black dress who vanished between two cars, the place where we honestly thought we’d backed the bus into someone, where one night we encountered hawks with dead birds (doves?) in their mouths, and where we once even found some chickens running around. As skeptical as I am, this place can give me the willies. There was also once a light attached to a building that was known to turn itself off and on when Holmes or one of the three victims most likely connected to the location were mentioned. Most nights, I thought it was just a bad circuit, but other nights it worked like clockwork. But where on this stretch of road WAS the factory, exactly? 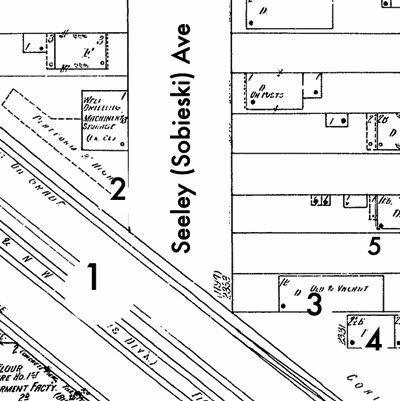 It would have been built without reliable records (that being the way Holmes rolled), and newspaper accounts at the time weren’t terribly helpful, only saying that it was on Sobieski Street, just Northwest of where the railroad tracks intersected Robey (Damen). That’s enough to narrow it down a lot – the stretch of road known as Sobieksi was a little dead-end road even then. On the west side of the road, we’ve found a half-buried brick that our archaeologist said had an 1890s-type of glaze, making us wonder if it may have been the foundation of the old building. 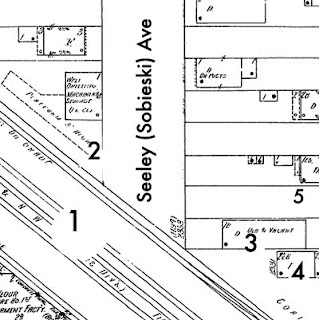 However, a fire insurance map from 1914 shows a set-up that echoes newspaper accounts (a long, one story building with a house at the rear) on the east side of the road. There’s a garage on that spot now; many employees have told me it gets awfully spooky in there at night. Here’s the map – it’s from 1914, nearly twenty years after the fact. I would have imagined that the building would have been gone by then, but who knows? 5 – the vacant/parking area today – the “Holmes Light” was at the back of it. When the police arrived in 1895, all that was left in the rubbish were some kilns and ashes. Whether they were human ashes was hard to tell – this was still an age when Holmes could say that the bones dug up in the castle were soup bones, and that the blood stains were paint, and expect to get away with it (at least for a while – the fire in August, 1895, destroyed much of the evidence). It’s entirely possible that more bodies were disposed of here than at the “Castle.” Aside from some bones and some things that COULD have been used to dispose of a body, not a lot of hard evidence was found in the castle basement. There was a quicklime pit, but it did not appear to have ever been put to use (the lime was clean and white). Some human bones were found, and a large oven, but operating these (as well as the torture equipment which many later authors have believed were found there) in such a crowded building without arousing suspicion would have been a real trick. Besides which, there had been a Tribune article about the secret passages in the building in early 1893. Holmes HAD to know it would be dug up in the event that he was ever caught. And the two weeks they spent digging there gave Patrick Quinlan, his janitor, plenty of time to empty out the rubbish at the glass bending factory. Holmes certainly was familiar with the area around “Sobieski Street.” It’s a long way from his South Side stomping grounds, but very close to the Wrightwood St. apartment he rented for Minnie, and a few blocks in the other direction from Franke Wilde’s Fruit and Candy store – police at the time were confident that Holmes was Frank Wilde (he mentioned having a place on Milwaukee Avenue in own writings, though in his “confession” he says his attempts to kill employees there failed). The ghostly activity here brings up a question that’s always worth debating: can ghostly activity be evidence of a murder? It sure wouldn’t hold up in court, but this may be the only evidence one way or the other about Minnie and Anna Williams, or of Emily Van Tassel, a Franke Wilde employee who is one of the half dozen or so known Chicago victims of Holmes. I’ve always thought she was more likely to have been killed here than at the Castle; same with Anna Williams. We’ll be running an investigation and recording a new podcast at Sobieski Street soon! Is there any relation with HH Holmes and the Paris Morgues ( Ile de la cite ) in the late 1800's? Just seems fitting to me. Hi Adam…I live close by ( Diversey / Western )and need to know when are you going around that area. I would like to meet up with you guys. Sure thing, Lynn! The street on the north end of Seeley is Fullerton. Damen runs parallel just east of the site. I took some neat pictures there tonight that i may post on monday. I have searched Google maps tirelessly for the location noted on Seeley Avenue. Could you possibly include a cross street where I could search to find it? I am not from Chicago and as far as I can tell, there is no point where Damen and Seeley cross one another. I would really love to SEE the location via a maps program. Thanks for your help Adam. St Charles Glass and Glazing – For all Your Residential and Commercial Glass Needs! Proudly serving Greater St. Louis, MO, Wentzville Mo, Chesterfield MO and surrounding area. We have the experience to handle all your glass or glazing needs, from frameless shower door installation to automobile window replacement and commercial projects, we do it all. Did HH Holmes make two confessions?